Plans to turn ex-council offices in Birkenhead into hundreds of student flats have been approved by Wirral council. On Thursday evening, the local authority’s planning committee pushed through proposals to convert the former council treasury building on Cleveland Street into 200 student units. 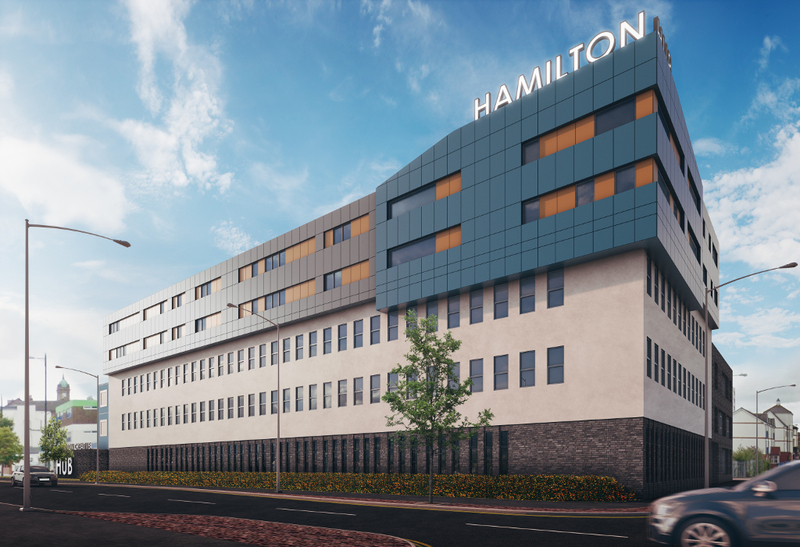 Liverpool-based developer YPG is behind the plans, which will see the building close to Hamilton Square become known as the Hamilton Hub, and bring a new lease of life to the former offices that closed in spring 2015. Pushing the plans through, committee member Cllr Steve Foulkes said the building had “real potential” to be the start of “something a little bit bigger”. Speaking at the meeting on Thursday, he added: “I have never understood why the River Mersey is a barrier to students studying in Liverpool. “ Birkenhead needs a new dimension to its day and night life, and students add that. Fellow committee member Cllr Denise Realey added she thought it was a “fabulous idea”. The plans, believed to be worth around £12m, will mean transforming the three-storey former office block into units of both three and five storeys. The basement will be taken up by a communal lounge, study area, laundry room, gym, games room and kitchen. The upper floors will become studio apartments and bedrooms with en-suite bathrooms, as well as a lounge, gym, pavilion and private garden in the centre of the building. The existing car park will become open space for the students. But the plans were not without opposition, and were subject to a 25-name petition against the proposals and four individual objections. The four concerns raised were over excessive noise and litter the development could cause, encroachment on privacy, issues over the building’s height, and insufficient parking. The writer of the petition was not present at the meeting held at Wallasey Town Hall. In terms of specific changes to the building, an extension and roof will be added as part of the project, and the accommodation will consist of a mixture of fully-furnished bedrooms and studios with kitchenettes and an on-site manager. The only other ideas that had been submitted to council for the building were for a car park, the report said. Back in October, it was revealed the development would provide accommodation for students at a new Marine Education and Training Centre being developed in Wirral as part of the new Mersey Maritime Knowledge Hub. The Hub is being developed by Wirral Council in partnership with Liverpool John Moores University, Mersey Maritime and Peel Ports. Speaking after the plans were pushed through, Ming Yeung, managing director of YPG, said: “Knowledge-intensive sectors and higher-education establishments are vital regeneration catalysts for both Wirral and the wider Liverpool City Region. The building is in Cllr Pat Cleary’s ward. The Green Party member said at the meeting on Thursday: “I think members will have seen its scale – it’s already a very large building, and is going to get significantly larger with the increased footprint and height. “It’s a welcome aspect – reusing an existing building – compared with the previous application that wanted to demolish it and create a car park. Back in October, Wirral council leader, Councillor Phil Davies, said he saw the development as proof that Birkenhead was “once again becoming the vibrant, thriving town we all remember”. “We welcome developments such as this and, through the new Growth Company we are well on the road to getting off the ground, it will be the next in a long line of exciting developments which will transform Birkenhead’s economy, creating a high quality offer for skills, retail and leisure in a prime location on our waterfront.